The Cumberland & Dumfriesshire Farmers Mart P.L.C. had forward 3,021 store hoggs & 555 in lamb sheep at their weekly sale at Longtown on Tuesday 2nd March 2010. Store hoggs easy to sell. Top of £78.50 for Texels from Enzieholm, £77.50 High Fold and Adderston Shiels; Suffolk £75.50 Englishtown and Langton Mill; Blackface £73.50, £67 Gall, £61.50 Lamperts; North Country Cheviot £71.80 Adderston Shiels; Beltex £70.50 Low Longthwaite; Greyface £68 Cottage, £66.50 Linton House, £65.80 Collingel; Hill Cheviot £67.80 Falnash, £67.50 Grains Cottage; Herdwick £65.80 Cottage; Easycare £60.50 Collingel; Swaledale £56.50 Collingel. 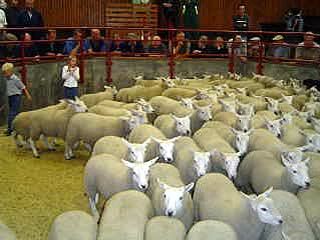 Cast ewes to £83.50 Lochwood, hill types £73.50 Gall, cast rams £95 High Fold. In lambers were another good entry with trade similar. Top of £130 for Texel crosses from Langton Mill who also sold Greyfaces at £124 and Blackfaces at £88; Suffolk Mule £112 Haithwaite; North Country Cheviot £88 Alnham Castle Hill. Geld hoggs to £87 for Suffolk Mules from Cowcorse. Ewes with lambs at foot opened out very dear. Top of £56 each for Cheviot Mules (correct below) with singles from Rockcliffe Cross who also sold twins at £48 each.